I had always heard that great artistes unite humanity but the demise of Bollywood’s most acclaimed actress Sridevi proves that great artistes can also unite rivals. The Hawaa Hawaai actress’s sudden death in Dubai, where she was there to attend her nephew’s nuptials, has not only left behind millions of Indians but also Pakistanis, in tears. As soon as the news of her death broke, heartfelt condolences started pouring in from all corners of Pakistan. From politicians to celebrities, to journalists, to laymen, everyone was deeply aggrieved and expressed grief over the actress’ unforeseen death in one way or the other. All the local dailies and websites covered each and every aspect of the 70s actress life, from the time she was born till her funeral and cremation and that too without any bias or rivalry for the ‘enemy’ country. In fact, for two to three days the top stories, articles and blogs of almost all local news and entertainment websites revolved around the Indian superstar. Our media reported each and every aspect of the late heroine’s death case without any bigotry. 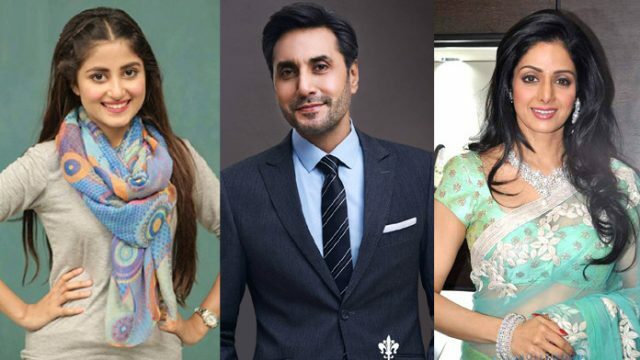 May be this response from Pakistan over Sridevi’s demise, is the result of the starlet’s final movie Mom wherein she starred besides two Pakistani actors: Adnan Siddiqui and Sajal Ali. This movie has played key role in connecting Bollywood’s leading diva to Pakistan and its denizens. The video message that Sridevi had sent to her Mom co-actors, since they could not make it then to the premier of the movie, due to rising political tensions between the two countries, also made rounds on social media after the news of her death broke. In fact, Indians went ahead to take notice of this positive reaction from across the border over the demise of their most celebrated actress. “Take a look at the sheer quantity, and heartfelt nature, of condolences pouring in from Pakistan on Sridevi’s demise” tweeted an Indian socio-political activist, Sudheendra Kulkarni. It was heartening to see Pakistan’s affection and tribute for a star from the ‘enemy’ country, at a time when lethal nationalism reigns hearts on both sides of the frontier. This reveals that despite all bones of contention, we still have one platform which can bring together the two arch-rivals on board and that is none other than art. The exchange of artists between the two nations, has had positive impact on the perceptions and thoughts of their people and has played significant role in deflating the level of enmity that was deeply ingrained in the hearts and minds on both sides from years. Our genuine mourning and heart felt consolations over Sridevi’s death have sent a strong message to India that we value art and humanity over and above everything. The ultimate point of this blog is that Art knows no prejudice, Art knows no boundaries. Hence, Pakistani artists should not be banned from working in India time and again nor should Indian artists be banned in Pakistan. Political and military tensions should not become a hurdle for artists when they wish to cross the borders to showcase their talent. Moreover, we should not criticize our celebrities for working in rival film industry because this is the only way to harmonious relations.